Abi is former German winger. Abramczik was right winger although mainly playing deeper in midfield who sometimes knew to play on the left side. He was excellent crosser and many Klaus Fischer's goals were scored after his crosses. Besides Abi was very fast player, recorded 100 meters in 11,1 seconds, very agile with good dribbling, solis shot and good endurance, slender and mobile. Actually he was good player but lacked consistency, his career was full of highs and lows which prevented him of becoming great star of German football. Discovered was the son of a locksmith by Berni Klodt, who tracked down the boy with alder 08th At ten, he moved to FC Schalke 04, who knew to appreciate the speed and agility of the right wing early. Only 17 years ago, on 11 Abramczik August 1973 at 0-3, the youngest Premier League player made his debut in the top German league. He scored his first goal five weeks before his 18th Birthday. He met on 12 January 1974 to 1:0 in Bochum Schalke (final score: 5-2 for the miners). His first senior international game was also not long in coming. "Abi" who had been involved in 23 youth international games, celebrated in the 5-0 against Northern Ireland (April 27, 1977) made his debut in the team of Helmut Schön. Especially one of his former coach was amazed. Max Merkel had yet claimed his Schalke time: "Before he (Abramczik) international will, I'm a singer at the Metropolitan Opera." Overall, the Schalke 19 came on home-grown operations in Dress of the Association, for which he marked two goals. Tragic for Abramczik: When he moved from his footballing career high point was reached, weakened the national team. At the World Cup in Argentina failed Vogt, Fischer, Rüssmann, Abramczik and Co. in the final round to Austria. Back in 1979, followed the departure from the national team. The right winger had tangled with DFB president Hermann Neuberger and also subject to strong fluctuations in performance. World-class performances, and black days alternated with him in starting times. Because of financial problems had to Schalke in 1980 his "street soccer" (Abramczik father: "His tricks were only here on the farm almost brought to completion and then only played in the club!") To sell. For 1.1 million dollars he was transferred to Borussia Dortmund, where he was now with Manni Burgmüller a dreaded storm duo. After a year at first FC Nuremberg (83/84), Galatasaray Istanbul and RW Oberhausen in 1987, he returned again back to his roots and jumped in for four games as a sweeper at the Royal Blues. 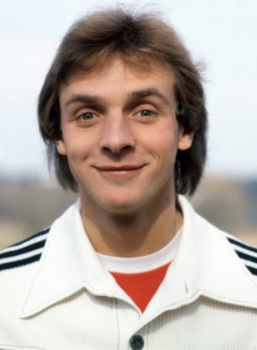 On 14 November 1987 Abramczik denied, his brother Volker also was a professional footballer, his last of 316 Bundesliga matches (77 goals). His success in football made him financially independent. In his home town of Gelsenkirchen after he bought and after about 30 houses and flats. He was next to a dye house and a sports shop. But football made him even after his playing career is not happening. He became a coach (1.FC Saarbrücken, Antalyaspor, Levski Sofia) and most recently worked at the Austrian Bundesliga club FC Kärnten.